What a fun book! This is not your usual damsel in distress story. Quite the opposite. This story is about a girl who believes a girl can do anything a man can do, and she’s out to prove it. Cade O’Brien is done with the loud and crazy towns. He wants peace and quiet and a new start. 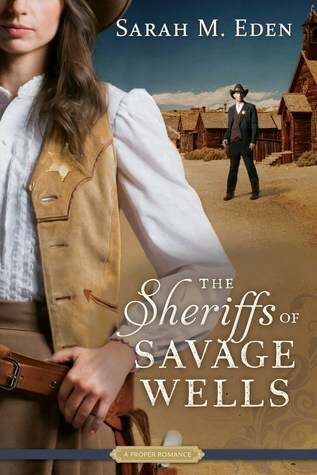 So he sets off to Savage Wells in hopes of becoming their new sheriff. But what he doesn’t expect is a woman already doing the job, and quite well, if he must admit. This spit fire of a woman gets his blood boiling in more ways than one, so he needs to keep a clear head whenever she’s around. Paisley Bell has been acting sheriff for quite some time now and she’s not happy that the town is determined to fill the position with a man, instead of her. But when Cade comes into town, she knows that her work is cut out for her. He knows what he’s doing, but he doesn’t know this town better than her. But she’s not giving up. She knows she can do this job just as good as anyone else. I must admit, I fell in love with this town and all it’s quirky, but lovable characters. I wish I lived there. They care a great deal about each other. Watching Cade and Paisley both interact with them, made me smile. They knew how to help everyone in very unconventional ways. It made my heart squeeze. Watching Cade and Paisley banter made me smile. He’s not used to a woman in this position, so he’s a little slow in accepting. They go at each other quite often and I found myself giggling. As with many relationships, once the bantering starts, it’s over. They’re sunk. They learn to help each other out and in the midst of that, they start to grow closer and soon find themselves completely smitten. When he calls her love, I swoon. Let me tell you, butterflies were fluttering in my belly. Such a sweet romance. This story is another in the The Proper Romance family and I know you’ll love it just as much as I did.